In the beginnings of their 16,000-mile honeymoon adventure, California natives Dana and Ginger Lamb made it to the state of Jalisco in western Mexico. The year was 1933. A little over an hour west of Guadalajara was the sleepy town of Teuchitlán. The two knew they were in a special place. The town’s name was a Spanish corruption of the native name for the place Teotzitlán, which means, in the Nahuatl language of the Aztecs, “the place dedicated to divine forces,” or “where the gods are revered.” Just outside of town was a vast low-lying ruined city, overgrown with brush and trees. The Lambs had heard of this place, first described to the outside world in an obscure publication by British traveler Adela Breton in the 1890s, but no one knew very much about it. Locals would come and take the stones away for building in town or for other uses in the country. They called this area Guachimontones which combines two words, “guachis,” a native word for a type of small willowy tree and “montones,” which means “a lot” in Spanish. The Lambs were so fascinated by this little-known place that they mentioned it in their 1938 book titled Enchanted Vagabonds which was one of the most-read non-fiction books in their day. Dana and Ginger Lamb continued on their honeymoon adventure and Guachimontones remained a mere footnote in travelogues and tourist brochures until the early 1970s when more outside attention was drawn to the site, especially the city’s most curious features, the circular pyramids dominating the city found nowhere else in the world. Archaeologists initially believed that Guachimontones was an Aztec outpost or perhaps belonged to an early Tarascan kingdom. As excavations began in earnest in the 1970s, Guachimontones distinguished itself as being part of a previously unknown culture soon dubbed “The Teuchitlán Tradition.” The people who occupied the city and surrounding areas have loosely been linked to similar civilizations more to the west, in the present-day Mexican state of Nayarit. The people to the west also had circular buildings and plazas and shared some of the same ceramic traditions, as well as a custom of burying the dead in shaft tombs, but Guachimontones stands out because it is the home of circular stepped pyramids which are unknown in other parts of Mesoamerica and are perhaps unique in the world. 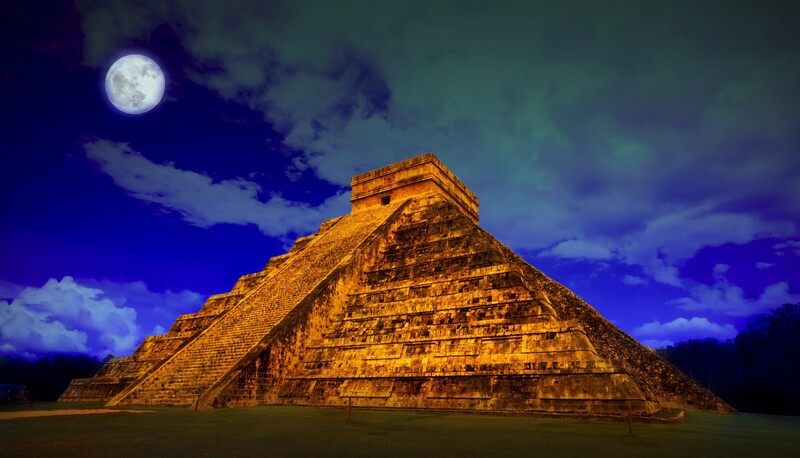 Archaeologist are still trying to put together the formal story of the Teuchitlán Tradition, but over the past 20 years much has been learned about the lost city of the strange round pyramids and the society that built it. Occupation at the site of Guachimontones began around 350 BC and may have lasted until about 400 AD. Archaeologists believe that the western Mexican Teuchitlán Tradition lasted from about 400 BC to around 900 AD, and may have declined about the time when Tarascan kingdoms began to influence the area from the east. At its height, around 1,800 years ago, Guachimontones most likely had a population of around 40,000 which made it a very important civic-ceremonial site in the region. 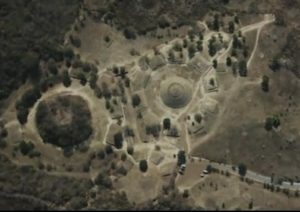 15 smaller satellite towns in the area have been identified from the air, exhibiting the characteristic circular architecture found at Guachimontones. Settlements from Guachimontones proper may have extended a full kilometer from the central part of the city, even going so far as Lake La Vega, where evidence of ancient chinampas, or floating gardens, has been found. The main city of Guachimontones was dominated by monumental architecture primarily divided into individual circular complexes. There are 10 such circular complexes following the same architectural “formula.” Each complex has at its center a circular pyramid. An elevated circular patio surrounds the pyramid. A circular sidewalk surrounds the patio, and on this sidewalk there are between eight and twelve rectangular platforms. Tombs exist under some of the platforms. The stone platforms once had buildings on them made of perishable materials which may have served as residences of the elites or for ceremonial functions. In the Teuchitlán Tradition there exists an overabundance of clay figurines which serve as a chronicle of daily life in the area in ancient times. In some of these figurines, which were assembled into scenes, we can see the types of wooden and straw buildings with large roofs that may have surrounded the pyramids on the circular sidewalks. In addition to the 10 circular complexes dominated by circular pyramids, at Guachimontones there are also four large rectangular plazas and two ball courts in which the ancient Mesoamerican ball game was played. The ball court located between the two largest circular complexes is one of the largest such playing fields in all of western Mexico. The biggest structure at the site is the circular pyramid found at what archaeologists call Circle Two. It stands over 60 feet tall, with sweeping views of the surrounding terrain and of Lake La Vega, and includes 13 terraces leading up to a top altar with an additional 4 terraces. The circular pyramids, and many of the other larger structures in the city were finished with lime and painted an orange-red, terra cotta color. Many of the surfaces were decorated with geometrical designs or rudimentary pictographs. There is no evidence that the ancient people of Guachimontones or the inhabitants of the other sites of the Teuchitlán Tradition had a written language. The many unearthed figurines also give archaeologists some ideas about rituals practiced at Guachimontones. A common figurine features the danza de cadenas or “chain dance,” a ritual dance still in practice in some parts of Mexico at the time of the Spanish Conquest. The dance was usually comprised of all men or all women dancing as a group, arms interlocked and moving in a circular motion. The centuries-old figurines depicting this dance are very reminiscent of the modern-day Mexican clay craft sold to tourists called “circle of friends.” Some archaeologists believe that the danza de cadenas included hundreds of people locked in arms dancing in ritualistic fashion around the circular pyramids at Guachimontones. Another ritual found in the figurines, and supported by the deep holes in the centers of each pyramid, was the voladores dance. This dance is performed for thousands of tourists in Mexico today. Performers climb to the top of a tall pole, tether themselves to the top of the pole and then jump, flying around the pole in a circular motion. In the figurines, sometimes priests are depicted as laying on top of the pole with arms and legs outstretched to imitate a flying bird. It’s clear that the flying rituals connected with the poles at the centers of the pyramids date back to the very early days of this city as excavations at the main pyramid at Guachimontones show a shaft for the voladores pole in each of the 4 layers of the pyramid in each of the 4 stages of its building. The main circular pyramid at Guachimontones has 4 staircases to its top, corresponding to the 4 cardinal directions. The association with the Mesoamerican wind god is not irrefutable but it is strong here. As there is no writing system at the site, or murals or public art illustrating a mythology, archaeologists can only make educated guesses as to the real ceremonial focus of this place. Mexican archaeologist Efraín Cárdenas of the Colegio de Michoacán has been supervising most of the digs at Guachimontones since 1998. Looting has decreased there, although the site was put on the United Nations’ World Monuments Watch List of the 100 Most Endangered Sites in 2008. With more formal excavations and other research, the picture of what went on at Guachimontones in ancient times is becoming clearer and clearer. Most of the site remains unexcavated and the ruins are still not very well-known to tourists. There is a lot left to develop, discover and learn about this place. What has been called the Teuchitlán Tradition may be reclassified by archaeologists sometime in the future as a distinct civilization with the gigantic circular pyramids at the center of Guachimontones as its focal point. Foster, Michael S. and Phil C. Weigand, eds. The Archaeology of Western and Northwestern Mexico. Austin: Westview Press, 1985. The official web site for the Guachimontones Archaeological Zone.